If you are looking for a cheaper and more convenient way to have an eBike, then the best electric bike conversion kit is for you. It is a well-thought-out kit designed to convert any bike into an eBike. It is based on the concept that electric bikes hugely depend on motors and controllers. 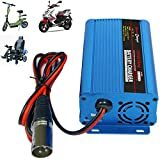 For this reason, a top quality electric bike conversion kit always comes with a powerful motor, a controller, and other accessories.It is normally very easy to install, given that it comes with a user manual. Some electric bike conversion kits are designed for front wheels, while others are meant for rear wheels. Here, we discuss all of them to make sure you know exactly what to spend your hard-earned cash on. 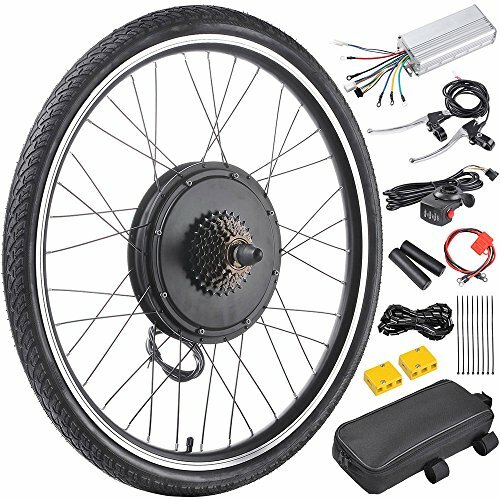 When you buy this electric bike conversion kit, you get a 1000-watt 48-volt brushless hub motor, an electric controller, one 26-inch front wheel, a speed throttle, two brake pullers, two handlebar grips, one LCD display, one PAS, one controller bag, one battery connection cable, one fuse, one rope, one set Widing pipe/Cable tie, and one manual. The kit does not come with a battery or charger. But considering the number of pieces it comes with, the absence of the battery/charger should not be a deal breaker. According to the manufacturer, the battery that works with the motor of this kit is Electro Kinetic cell batteries which are NiMH, lead-acid, and Li, among others. Its motor boasts an efficiency of more than 80-percent. For this reason, you will be able to get the most out of this kit.Since it includes several pieces, you will need the manual for easier installation. The LCD display, which comes with the kit, will show you the battery power, so you can know early enough when to recharge the battery. It also indicates gears, mileage, speed, and time. The PAS, which is simply the Pedal Assistance System, will allow you to cycle while driving your electric bike. There is also the Dual Mode Controller that allows the motor to work both under Hall effect and non-Hall effect. By so doing, the dual mode controller will help extend the life of your electric bike. Keeping the pieces of this kit is super easy. And this is because of the cloth carrying bag, which has a zippered main compartment for keeping the controller. The cloth carrying bag is made of a long-lasting 600D Oxford fabric, meaning its durability should not be a concern. This kit does not just offer a tire frame; it provides a whole wheel with tire. 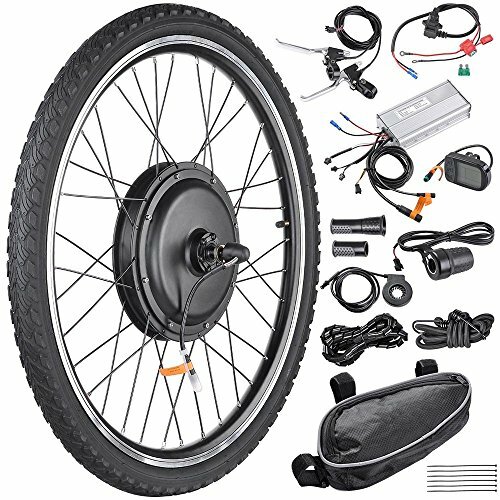 This electric bike conversion kit includes a manual, 1set Widing pipe/Cable tie, one 1000-watt 48-volt brushless hub motor, one 26-inch rear wheel, one electric controller, two brake pullers, one speed throttle, two handlebar grips, one LCD display, one PAS, one controller bag, one battery connection cable, one fuse, and one rope (color is at random). To get the most out of the kit, the manufacturer recommends that you consider an electro kinetic cell battery, which includes a NiMH, Li, and lead-acid batteries, among others. The motor measures 245 millimeters in diameter, and its efficiency is more than 80%. The motor also has dropout spacing of 135mm. Please note that this kit is made for bicycles only. It comes with everything you need for successful conversion. Its LCD display shows the battery power to ensure that you are not caught off-guard. The LCD display also indicates mileage, gears, time, and speed. Like the first kit on this list, this one comes with a cloth carrying bag that has a main zippered compartment for keeping the controller. Besides, the cloth carrying bag is made of 600D, so it can deliver a solid performance. 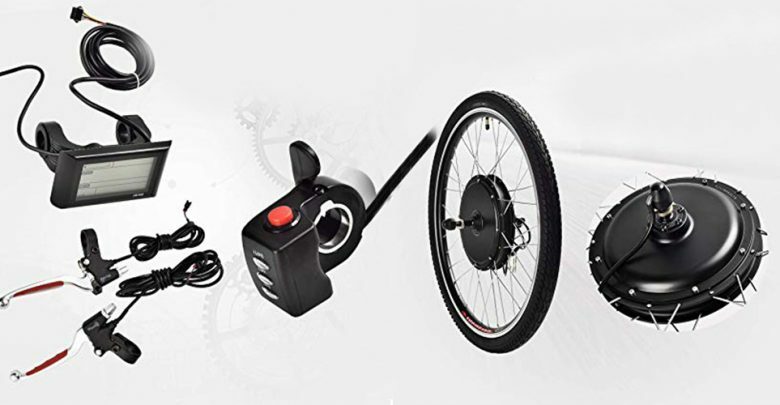 The Dual Mode Controller of this kit allows the motor to work under both Hall effect and non-Hall effect, thereby, extending the life of the electric bike. Moreover, there is a Pedal Assistance System (PAS) that will allow you to enjoy cycling while driving your electric bike. To make sure that you are not inconvenienced in any way, this kit comes with a complete wheel set, which includes a reinforced 32-millimeter rim and 40-millimeter tire. We have included this kit in these reviews because we are impressed with its performance. That said, we hope you will find it impressive as well. 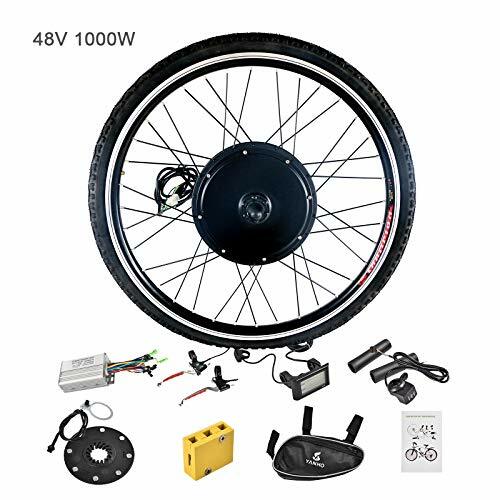 The price of this electric bike conversion kit is somewhat on the lower side compared to the first two we have talked about. Having said that, we think it will be a great purchase, especially if you are on a budget. 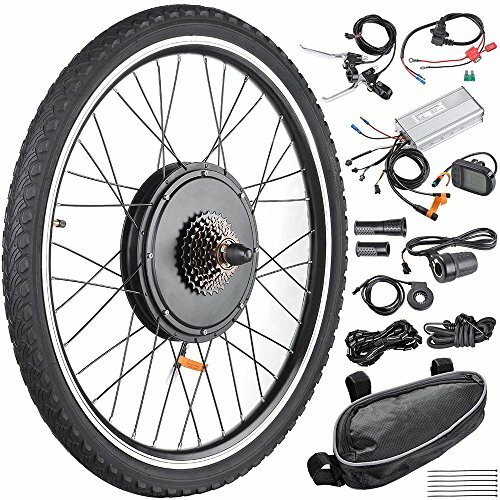 Despite its very affordable price, the electric bicycle motor kit comes with fairly several pieces. And these pieces include one 1000W 48V brushless hub motor, one manual, one 26-inch rear wheel, one controller bag, two brake pullers, one terminal box, one electric controller, one battery extension line, a speed throttle, one set Widing pipe/Cable tie, and two handlebar grips. The battery recommendation for this kit is electro-kinetic cell battery, which are NiMH, lead-acid, and Li batteries, among others. Besides, this kit has great motor specifications, which are 1000 watts, 48 volts, and 470 revolutions-per-minute.Plus it features a drive system, which has no moving chains or gears. For this reason, expect zero friction. And with zero friction, there is higher efficiency, which, in turn, ensures that the drive system has less chance to break. Like AW’s powerful electric bike conversion kits, this one boasts a Dual Mode Controller, which helps extend the life of the electric bike by allowing the motor to work under both non-Hall effect and Hall effect. AW will not just provide you with a tire frame when you buy this kit; they offer a whole wheel with tire. Ideally, you will not take long to install the wheel and the tire. The thumb throttle, which comes with the kit, has 3 LED indicator lights to make sure you are totally satisfied with your purchase. This kit is for bicycles only, and for the price, we think it will make a wonderful purchase. This is another cheaper option you can consider if you do not want to break the bank yet you are after top quality electric bike conversion kit. It includes a high-performance 750-Watt 36-Volt brushless hub motor, one 24-inch front wheel, one electric controller, two brake pullers, a speed throttle, two handlebar grips, one battery carrying bag, one rope (color is picked at random), one set of Widing pipe/Cable tie, and one manual. The manual provides a clear guideline on how to use these pieces to install the tire perfectly and in a short time. This kit neither comes with a charger nor battery; however, it is still worth spending money on, given the performance it delivers. Its hub size is 20-1/2 inches, and its motor delivers an efficiency of more than 80%. The kit is great for installing tire sizes of 24” by 1.95” – 2.5”. Its motor is powerful enough to allow a top speed of up to 25 kilometers-per-hour. 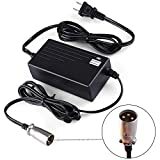 Moreover, this kit features a new design of waterproof connection. Well, this ensures more convenience and stability for installation or maintenance. There is also a thought-out drive system that has no moving chains or gears. And this means it is more efficient not to mention having a less chance to break. The thumb throttle has 3 LED indicator lights to allow you to get the most out of the kit. In addition, AW has included a brake system, which shuts off the motor automatically to save energy as well as to improve safety. Although this kit does not come with some pieces that are there in those expensive brands, it is still worth spending money on, because it has all the basic pieces to help you get the results you want. 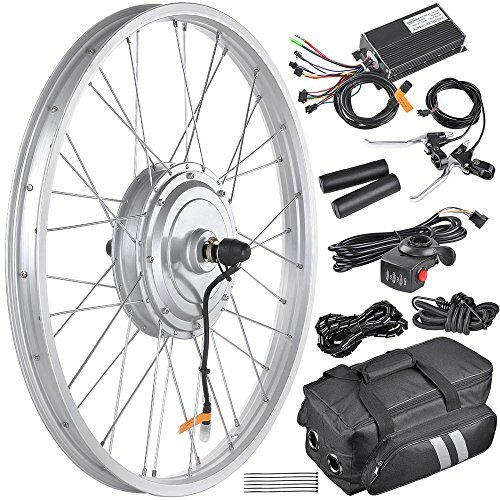 Most of the electric bike conversion kits we have reviewed are either designed for front wheels or rear wheel. However, the Murtisol Electric E-Bike Motor Kit works with both the front wheel and rear wheel. This means it is very convenient to use. It is a complete kit that includes one 48-volt controller, one LCD display, two handle grips, one 48-volt 1000-watt motor, one 26-inch front wheel/rear wheel, two hand brakes, one harness, one user manual, and one controller bag.The LCD meter ensures safe riding, and it is built to meet the requirements of CE and EN15194, meaning it is built to the highest standards. The LCD display works with the Twist throttle and brake levers to guarantee you unwavering safety. The LCD display shows the remaining power of the battery as well as indicating the time, speed, gears, and mileage. 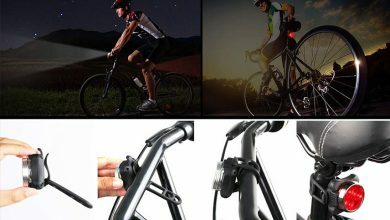 The brake levers, on the other hand, work by safely cutting off the power supply to the motor, while the twist throttle features a power-cut button and battery level display.This kit will provide you with double way double power, which is a combination of a motorized bike and a pedal bike. This combination makes it the go-to item for those who enjoy long rides. Moreover, the kit ensures intuitive installation, so you can have your bike ready after just a short while. It is great for a bike with a front fork of 3.9” and a rear fork of 5.3”. It features a powerful aluminum alloy controller that works with the rear-earth metal magnet, found in the motor, to produce peerless power. With that in mind, hitting top speeds with the aid of this kit will not be a problem. Despite working so great at what it is meant to do, this kit is within an affordable range. Before you buy an electric bike conversion kit, be sure to have a look at the following factors. Some electric bike conversion kits are designed for front wheels, while others are made for rear wheels. There are also others that work for both rear and front wheels. In order to avoid inconveniences, be sure to choose a conversion kit that is suitable for the wheel you plan to reinforce. In our opinion, you should go for an electric bike conversion kit with a powerful motor. This is because a motor with great specifications will help you hit amazing speeds; which is one of the reasons you are going for a conversion kit, right? Like the motor, you must be keen to settle for an electric bike conversion kit with high battery capacity. This is especially great if you love long rides, as the battery will remain functional even after covering a lot of distance. Different electric bike conversion kits have different numbers of accessories. 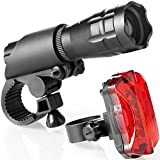 However, there are some accessories that your kit should not miss. 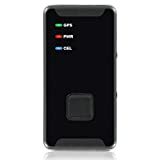 For instance, (other than the motor, which is basic), your kit should not be without the LCD display, as this will show you the battery power, time, gears etc. It should also not lack safety accessories such as the Twist throttle and brake levers. Why do I need to convert my conventional bike to an eBike? 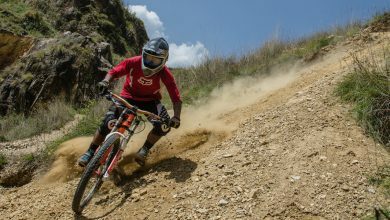 eBikes ride faster than conventional bicycles. Also, they put less pressure on the hips, knees, and other joints. Does the above electric bike conversion kits work on all bikes? Yes. Electric bike conversion kits are universal, and the above are no exception. Unless your electric bike conversion kit is waterproof, this is totally discouraged. What do “Watts” in motor specifications mean? This is simply the rating at which the motor of a conversion kit can run all day long without heating up. A motor gets damaged pretty fast if it keeps heating up during use. Riding an electric bike is great and fun. However, the process of acquiring one has always proven to be daunting; thanks to their high prices. So, unless you have the money to buy one, an electric bike conversion kit is the best choice. It provides an affordable and more convenient way to end up with an eBike.